We’ve been working on some updates to breakfast! We’re excited to show you the revised version here. This is available now and we’ll be posting a big menu on the wall in the Eatery next week. We’ll offer daily made to order breakfast from 8am to 11am Monday – Friday. And 8am to Noon on Saturdays. 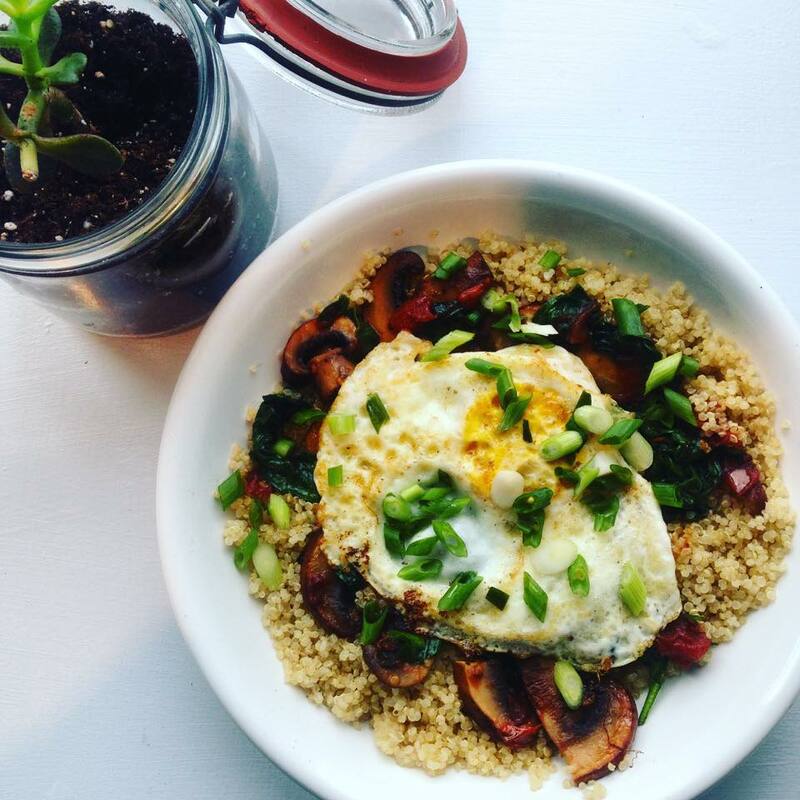 Our Savory Quinoa Bowl, a new menu item, is packed with protein and is so delicious! Come on in and try it out. We’ve got Counter Culture coffee brewed, sunlight pouring in and plenty of tasty treats. Our new breakfast menu is here! Check it out! Stop by soon! We have been trying to handle a number of inquiries regarding customers who have Laurey’s Catering Gift Certificates and want to redeem them at our business. Because of the path we had to take to get this company up and running, our business is a completely new entity and a new corporation. We have no legal association with Laurey’s Catering. While these are the cold facts, we do understand people’s eagerness to redeem coupons that they feel they are owed. We have been dealing with these issues as fairly as we can and on a case by case basis. Many people with outdated Certificates who had plenty of time to redeem them while Laurey’s was still in operation are not going to receive much help. We want to both satisfy customer requests while still putting our business in a position to succeed. Given that we are now approaching the 3 month mark for the opening of 67 Biltmore, we would like to put a time limit on these requests. We will accept inquiries from any outstanding Laurey’s Catering Gift Certificates until the end of August. This gives folks 2 more full weeks to get in touch with us. We would like to personally handle these inquiries, so please be sure to ask for Adam and/or Emily. We will do our best to respond to these requests in a timely manner. Thanks for understanding. Obviously, we also have our own 67 Biltmore Downtown Eatery + Catering Gift Certificates that are available for purchase at the front. We are happy to mail them with personalized notes as well! Most of you know that we try to honor Laurey Masterton in many ways. She was such a spirit of Joy for us and our community. During her last years of her illness she found a lot of support in the Livestrong Program at the YMCA. After her completion of the program she wanted to be more involved as she often did when she truly believed in something. Laurey wanted to help raise money to fund the training for instructors so more Livestrong classes could be offered. She also wanted to help raise money to help the folks on the Livestrong waiting list get into the program faster. You see, the Livestrong Program is free to participants and their families. One of Laurey’s huge projects in the last years of her life was the JOYride. Sadly she was only able to witness and participate in the first year. With the help of the YMCA, Laurey’s legacy of the JOYride and raising money for this amazing program lives on. The 3rd annual JOYRide will take place on September 12. We know how much the program helped Laurey. She told us again and again. We know that this program gave her back her Joy after a hard and lengthy treatment. We are happy to continue to help the YMCA raise money for the Livestrong Program and we hope you will too.